An interest in nature and an interest in computers don’t obviously go well together. For a band of computer scientists interested in sound they very much do, though. 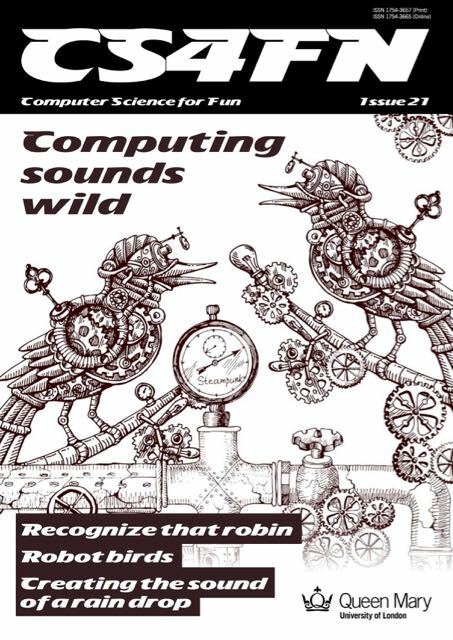 Here we explore the work of scientists and engineers using computers to understand, identify and recreate wild sounds, especially those of birds. We see how sophisticated algorithms that allow machines to learn, can help recognize birds even when they can’t be seen, so helping conservation efforts. We see how computer models help biologists understand animal behaviour, and we look at how electronic and computer-generated sounds, having changed music, are now set to change the soundscapes of films. Making electronic sounds is also a great, fun way to become a computer scientist and learn to program. Issue 21 of the cs4fn magazine directs you to the web site for more on various articles. Find all the articles as well as linked extras below. Do birds know how to sing at birth? Could we ever talk to the animals? What makes music sound evil? What is the secret of the way birds sing? How far can you hear? Paul Curzon, Dan Stowell, Jane Waite and Peter W McOwan of Queen Mary University of London (QMUL). Summer 2016. In addition to Queen Mary, EPSRC supported this issue through research grants EP/L020505/1 and EP/K009559/1. The issue was also supported by the Mayor of London and Department for Education. cs4fn is a partner on the BBC’s Make It Digital Programme. Spectogram Adelbert Range recording image courtesy of Eddie Game, The Nature Conservancy. The Gympie recording courtesy of Yvonne Philips, Queensland University of Technology (QUT). Sturt recording courtesy of Ecosounds.org. Spectrograms obtained from Michael Towsey, ecosounds.org, QUT.